You can make client vaults private to remove all access to users except for account administrators. When you make a client vault private, an icon appears in your client list to denote that the vault is now private. Any user who is an administrator can access private client vaults. Administrators cannot grant access to additional user groups on a private vault, but can grant access to individual users. 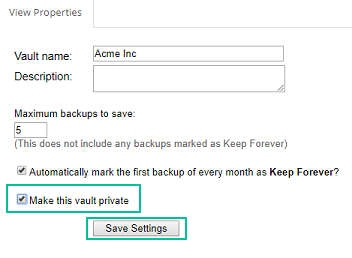 Private vaults no longer inherit group access permission settings from the folder template. However, the vault will reflect changes to the folder template such as adding new folders to the template or changing global notifications. 2. Click on the client for which you want to make their vault private. 3. Click the Container properties icon at the top of the screen. 3. Click the View Properties tab. 4. Enable the Make this vault private checkbox. Click the Container properties icon at the top of the screen. 3. Click the Access and Notifications tab. 4. Click Edit Access Settings. 6. 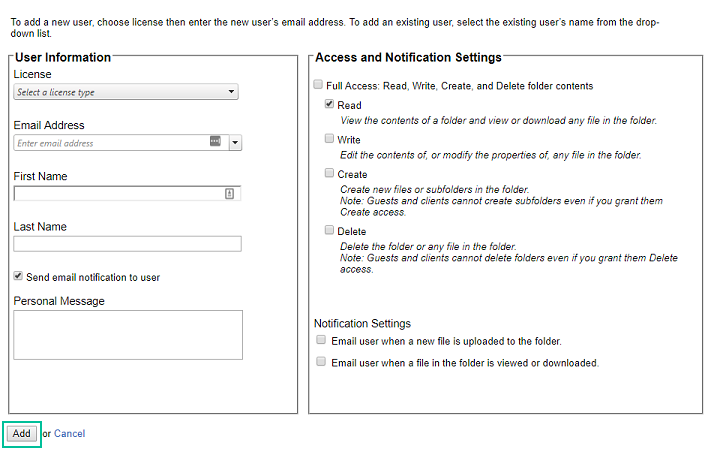 Enter user and access/notification information for the user and then click Add.